Can anyone help me identify what the tiny brown spots on my basil are and why it's happening? I looked through the forum and didn't see much. Here's the backstory...lots of rain. Just planted the Basil probably 2 or 3 weeks ago (transplants, not from seed) and then it started raining all day, everyday. So, is my basil doomed? The top-most leaves have tiny brown spots on them...at first glance they look like they might be bugs but when you get closer you see they are tiny brown spots....almost square shaped spots....lots and lots of them. Bottom-most leaves don't have them...YET! When I pick the leaves they wilt and turn brown quickly...it's not really even a vibrant green to start with. If it is a fungus I will spray the milk/water solution I read about. I got the Basil at Home Dept and they have a 1 year return policy for plants so do you think I should just return them ang get some more? Ok, so I went home and took an even closer look. The basil is actually a pretty vibrant green...I was wrong. It's once they are picked that the leaves discolor quickly. I plucked off all the leaves with brown spots and I will see if it continues to spread. Does this sound like a fungus? Or is this just want happens to Basil when it is overwatered? The spots are kind of clearish in the middle actually (but are not holes). I've noticed a couple tiny red spiders (1mm wide) wandering around... and also a black and yellow beetle of some kind (just under 1cm long), but no notably large populations really. It is diseased. 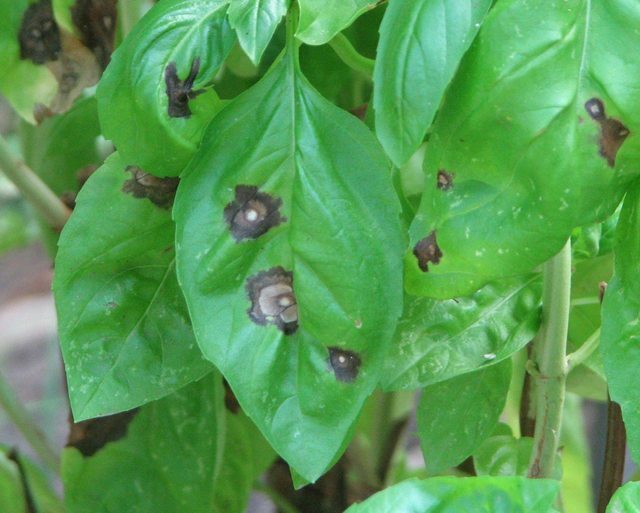 Most likely basil leaf spot (Cercospora), a fungal disease, but possibly basil bacterial leaf spot. Light centered irregular spots with a darker halo is a pretty common look for this disease. In either case the disease vectors are harbored in the soil. Remove all spotted leaves (and trash, not in compost pile). Mulch heavily and be sure that soil does not get splashed up on the leaves. Water the soil, not the leaves. Be sure there is plenty of space between your plants for good airflow and to be sure that leaves of one plant don't touch another. Clean/ disinfect any tools that come in contact with affected plant parts. In case it is a fungal disease, you can treat the plant (AFTER you remove affected leaves) with hydrogen peroxide or baking soda solution. Brown Spots on Basil Leaves?